Yesterday a quick rainstorm came through. Shortly after it passed, a beautiful rainbow appeared in the sky, a perfect arc that touched down somewhere this side of the distant hills. While my 2-year-old nephew thought the rainbow very pretty, he would have none of the explanation, so I offer it here to you. In our last post, we talked about why the sky is blue, and in particular, we mentioned that light from the Sun contains “all the colors of the rainbow.” We also mentioned that the atmosphere contains water vapor, the amount of which is obviously higher just after a rainstorm. To these two elements we add a third: the refraction of light. Light refracts, or changes direction, when it enters a different material, and the amount and direction of refraction depends on a property of the material called the index of refraction. For example, light traveling from air into water refracts less than light traveling from air into glass because the index of refraction of water is lower. 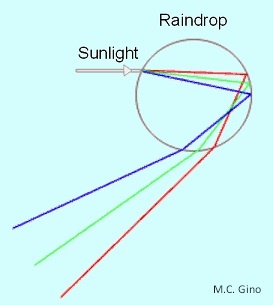 Refraction depends on the wavelength as well, with blue light refracting more than red light. This is known as dispersion, and it also depends on the material. So given some sunlight, a raindrop, and a bit of physics, what happens? The figure below shows a raindrop. See how the colors separate when sunlight enters the raindrop? This results from refraction and dispersion. Look now at what happens when the light in the raindrop tries to get out the other side. It reflects! If light incident on this part of the raindrop is not perpendicular enough to the surface, it will reflect instead of refract; this is known as internal reflection. So light enters the raindrop and reflects off the inside, hitting another part of the raindrop. This reflected light now refracts a second time when it leaves the raindrop (the light is more perpendicular to the surface this time). Blue light again refracts more than red light, meaning the colors spread out even more. If you’ve looked carefully at the diagram, you’ll notice the blue light ends up on top. But rainbows don’t look like this! To observe a rainbow, you need to stand with the Sun at your back, facing the raindrops. Looking straight ahead, there is a band of raindrops where the blue light is directed at your eyes. The raindrops further up will be in a position where the green light reaches your eyes, and finally the raindrops even higher are in a position where red light reaches your eyes. So we see red on top! What about that pot of gold? I’m sorry to say you’ll never reach it. The rainbow’s location is not fixed, but rather depends on the your position and that of the Sun. If either you or the Sun moves, so does the rainbow! In fact, the rainbow’s semicircular shape also depends on these positions. Sunlight reflects off of all the water droplets in the sky; it just happens that the reflected light that reaches your eyes comes from a position 40-42° from the line connecting the Sun and your head. (This diagram may help clarify things.) Consequently, rainbows can only be seen when the Sun is within 42° from the horizon, or if you are high off the ground. And double rainbows? This is caused by light internally reflecting twice within the water droplet. This secondary reflection also causes the colors to be inverted, with red on the bottom and blue on the top. Between the two rainbows lies a dark band known as Alexander’s Band, after Alexander of Aphrodisias, the Ancient Greek philosopher who first described it. And last question… Why mention diamonds in the same article? Because they sparkle for pretty much the same reasons! Diamonds have high dispersion, which separates the colors a lot giving diamonds that characteristic fire. But diamonds can’t sparkle if light doesn’t internally reflect twice and exit out the top of the diamond. This depends on the index of refraction: the higher the index of refraction, the more likely it is that light will be internally reflected in a material. Diamonds have a very high index of refraction, making internal reflection very easy. This is where the cut of the diamond becomes important. 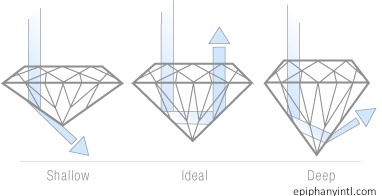 If the bottom angle of the diamond is too shallow or too deep, light will not reflect, or it will only reflect once, getting lost out the lower side of the stone, as in the figure below. The magic number for this angle, as it turns out, is about 98°, depending on the way other parts of the diamond are cut. The next time you’re shopping for diamonds (maybe before you’re forty), you’ll now know why your purchase should have the right cut. The things nature designs are often inspiring, but it’s always amazing how they can become truly dazzling with just a little bit of tweaking by human hands! It’s a very common question, and you’ve probably asked it at least once yourself, but do you have the answer? To explain, let’s start with the source of the light: the Sun. The Sun emits a lot of energy – light – spanning the electromagnetic spectrum from X-rays to radio waves. Most of this is either visible light (44%) or infrared (48%) radiation. Much of the remaining 7% consists of ultraviolet light. Wait… only 7%? I know what you’re thinking. Even though it makes up only a small fraction of the Sun’s light, we most often hear about this type of light because it is so damaging to our skin. The Sun emits all colors – wavelengths ­– of visible light, from short blue wavelengths (0.4 mm) to long red wavelengths (0.7 mm), but it emits more of some colors and less of others. If we plot the intensity, or amount of light, versus the wavelength, we end up with the figure shown below, called a spectrum. 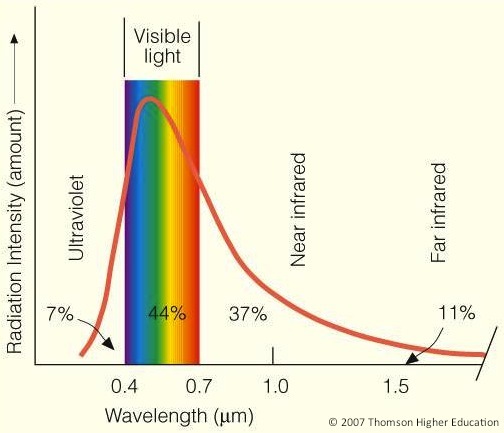 The familiar colors of visible light are shown as well for comparison with the wavelength. What do you notice? The Sun emits all the colors of visible light, but the color it emits most is green. But the Sun doesn’t look green! All those colors emitted by the Sun get blended together and the result is a Sun that appears white from outer space. This light leaves the Sun and speeds along its 8.3-minute trip to the Earth, where it hits the atmosphere. The atmosphere is composed of different atoms and molecules, most of which are nitrogen (N­­2, 78.1%), oxygen (O2, 20.9%), and argon (Ar, 0.9%). The remaining 0.1% is made up of a mix of different trace gases like neon (Ne), helium (He), methane (CH4), carbon dioxide (CO2), and ozone (O3). There is also some water vapor in the air, about 1–4% at the Earth’s surface, as well as some dust. When sunlight hits the atmosphere, it interacts with the particles in the air, and the way it interacts depends on the size of the particles. For large particles like water vapor or dust, all wavelengths of light reflect off the particles equally. The interaction of light with smaller particles, however, is much more dramatic. This interaction is called Rayleigh scattering. When light hits a particle, the particle absorbs the light and then releases it in a different direction. Rayleigh scattering depends strongly on the wavelength of light, which means that shorter wavelength, blue light is scattered much more than longer wavelength, red light. Blue light gets scattered in all directions, so it reaches your eyes from whichever part of the sky you view. Red, orange, and yellow light gets scattered less, so if you glance at the sky near the Sun (don’t look directly at the Sun! ), that portion of the sky will look yellower. Okay, so if the Sun emits more green light, why isn’t the sky green? It isn’t green for the same reason the Sun itself isn’t green: the colors that scatter the most create the blue color you see when they’re blended, or averaged, together. And if shorter wavelengths are scattered more, why isn’t the sky purple? This is simply because there isn’t much purple light coming from the Sun. There is much more blue and green light making the average scattered light appear blue. But here’s an interesting thought. If the surface temperature of the Sun were about 1500 K hotter, we would have a purple sky! Come back next week for a physical description of how rainbows form and why diamonds sparkle! You are currently browsing the Daily Science blog archives for July, 2011.